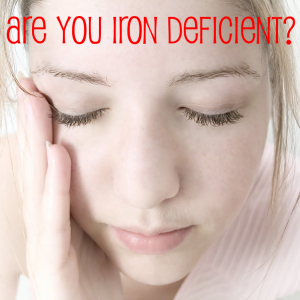 What Is Iron Deficiency & Why Should You Care? Iron deficiency can feel like a blah day. You are tired, your hair seems to be shedding more than usual, your nails aren’t as strong as usual, you feel cold and you can’t stop your mind from wandering off. Dr Oz said that if these signs seem to last longer than a month, you should talk to a doctor. Why so sleepy? It could be an iron deficiency. Look at the symptoms and options for getting your iron count back up. What is the key to beating fatigue? Iron. Dr Donnica Moore told us that iron is essential for hemoglobin, which transfers oxygen to the parts of the body. When a woman is on her period, that is when she needs to be getting the most iron. You lose blood for several days, so you need to keep your levels up. The test of this is by putting in a tampon. If you are changing it without two hours, then you are a heavy bleeder. Heavy bleeders need more iron than other women. Dr Oz had his audience tested and found out that a third of them were iron deficient, about right with the national average. A woman in the audience said it makes sense that she is iron deficient. She feels tired all the time, yet her doctor told her everything is fine just the day before. Dr Oz explained that it take more than looking at a blood cell count to know if a person is iron deficient. Exhausted after a good night’s sleep: Dr Moore said that if this persists for longer than a month, you need to talk to your doctor. Always cold: if the hemoglobin can’t get to the extremities of the body, then you don’t have enough iron. That’s why you feel chilled. Pale skin: Iron gives you a healthy look. The you don’t have a healthy glow then you need to think about why. The quickest test is by looking at the lower eyelid. If you see a pink tinge in it when you pull it down then you’re good. Can’t focus & wandering mind: The less oxygen rich blood getting to your brain, the more your mind is going to wander. Loss of hair and brittle nails.